There is so much to being a mom, isn't there? I mean the job description is quite long. If you were to look up a job on some career search site there would be a section that described the expectations that the employer has for this future employee. You following me? 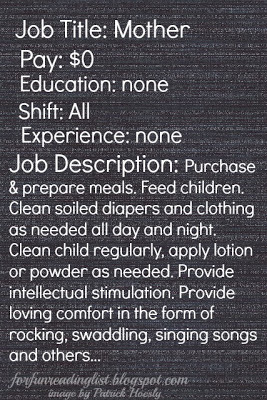 Imagine what it would look like if the job opening was for a mother? I'm pretty sure I missed quite a bit, and that's just the description for the first couple of months into a child's life. There is then play time activities that need to be incorporated. Teaching life skills, cleanliness, manners, etc. Then there's the issue of finding options for schooling and preparing for every new stage that children race through in the first eighteen years of their lives. Could it even fit into one of these boxes that contain the job description? And since the description could so easily go on and on, how does one prepare for such a job? I've often joked about how nice it would have been to have received a nice thick handbook from the hospital when I delivered. One that contained information for all the questions that would come day after day for the rest of my life as a mom. Yes, sure, they give you paper work on how to respond to choking and poison ingestion, or numbers to call when certain emergencies arise, but my days are full of pressing issues that are just not included in that paperwork/manual. On one such occasion when this little joke of a mommy manual came up a wonderfully wise older mama must have heard my desperation hidden among my joke. Maybe it pulled up a memory of when her life was crazy with little ones, when she didn't feel equipped to do any mothering, just completely out of creative ways to teach and love and lead these precious little souls that had been entrusted to me. She came up to me at the next event and quietly leaned over to me. 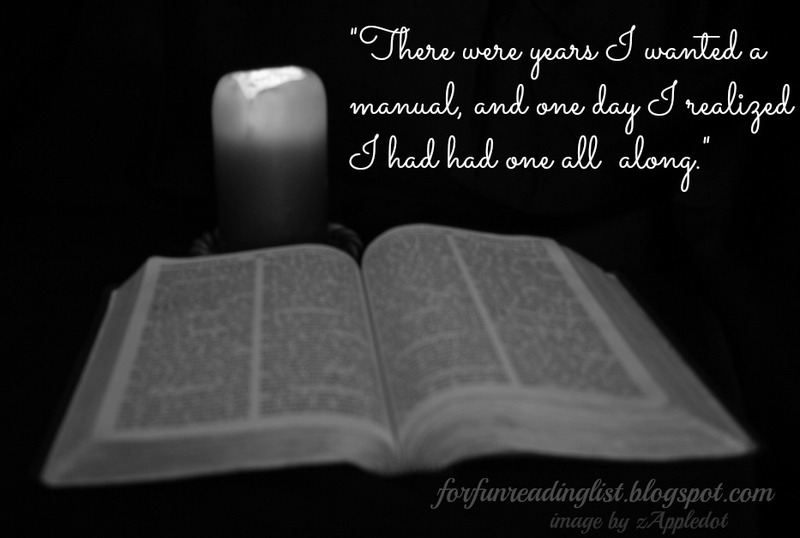 She pulled out a worn leather bound book, a book that must have been through it all. And laid on a counter next to us. 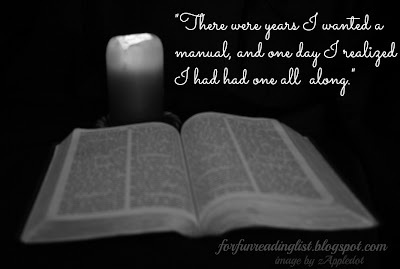 She said to me, "There were years where I wanted a manual, and one day I realized I had had one all along." It was her personal Bible, a one year woman's devotional Bible, that she had run to over and over as she felt unqualified to mother her own children. You see, of course the hospital couldn't give me a handbook, they had only helped me to deliver this precious little one. The only One who could give me guidance on how to fill this job that He had given me, had already made sure I had possession of the manual. I just had to look to it for direction and go to Him for clarification when I needed it. He doesn't want me to fail. I just have to look to Him for the answers and the guidance.